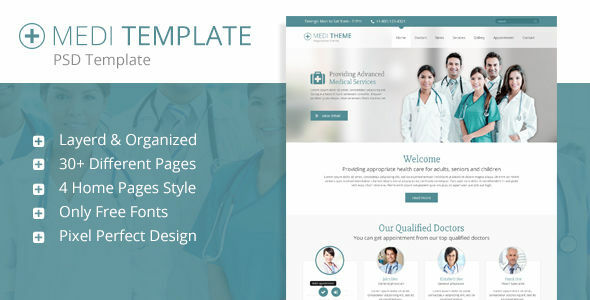 Medical PSD Templates are best for medical blogs, hospitals, medical centers, health centers, dentists, surgeons and other type of health and medical related websites.Templates built on latest bootstrap grid system. PSD’s are maintained in a minimalist and modern style with strong color accents and files are fully layered and ready to customization and all elements are in groups, so can easily identify by the group name as well to help you make changes in the page structure of the template. The templates comes with more than 30 different pages including blog with comments, about us page, team page including single doctor page timetable or schedule page, gallery with different layouts together with single photo page, pages with different components (page styles), pricing plans page and a contact page.